WASHINGTON (AP) — The huge West Antarctic ice sheet is starting a glacially slow collapse in an unstoppable way, two new studies show. Alarmed scientists say that means even more sea level rise than they figured. The worrisome outcomes won't be seen soon. Scientists are talking hundreds of years, but over that time the melt that has started could eventually add 4 to 12 feet to current sea levels. A NASA study looking at 40 years of ground, airplane and satellite data of what researchers call "the weak underbelly of West Antarctica" shows the melt is happening faster than scientists had predicted, crossing a critical threshold that has begun a domino-like process. "It does seem to be happening quickly," said University of Washington glaciologist Ian Joughin, lead author of one study. "We really are witnessing the beginning stages." It's likely because of man-made global warming and the ozone hole which have changed the Antarctic winds and warmed the water that eats away at the feet of the ice, researchers said at a NASA news conference Monday. "The system is in sort of a chain reaction that is unstoppable," said NASA glaciologist Eric Rignot, chief author of the NASA study in the journal Geophysical Research Letters. "Every process in this reaction is feeding the next one." Curbing emissions from fossil fuels to slow climate change will probably not halt the melting but it could slow the speed of the problem, Rignot said. Rignot, who also is a scientist at the University of California Irvine, and other scientists said the "grounding line" which could be considered a dam that stops glacier retreat has essentially been breached. The only thing that could stop the retreat in this low-altitude region is a mountain or hill and there is none. Another way to think of it is like wine flowing from a horizontal uncorked bottle, he said. Rignot looked at six glaciers in the region with special concentration on the Thwaites glacier, about the size of New Mexico and Arizona combined. Thwaites is so connected to the other glaciers that it helps trigger loss elsewhere, said Joughin, whose study was released Monday by the journal Science. Joughin's study uses computer simulations and concludes "the early-stage collapse has begun." Rignot, who used data that showed a speed up of melt since the 1990s, said the word "collapse" may imply too fast a loss, it would be more the start of a slow-motion collapse and "we can't stop it." Several outside experts in Antarctica praised the work and said they too were worried. "It's bad news. It's a game changer," said Ted Scambos, lead scientist at the National Snow and Ice Data Center, who wasn't part of either study. "We thought we had a while to wait and see. We've started down a process that we always said was the biggest worry and biggest risk from West Antarctica." The Rignot study sees eventually 4 feet (1.2 meters) of sea level rise from the melt. 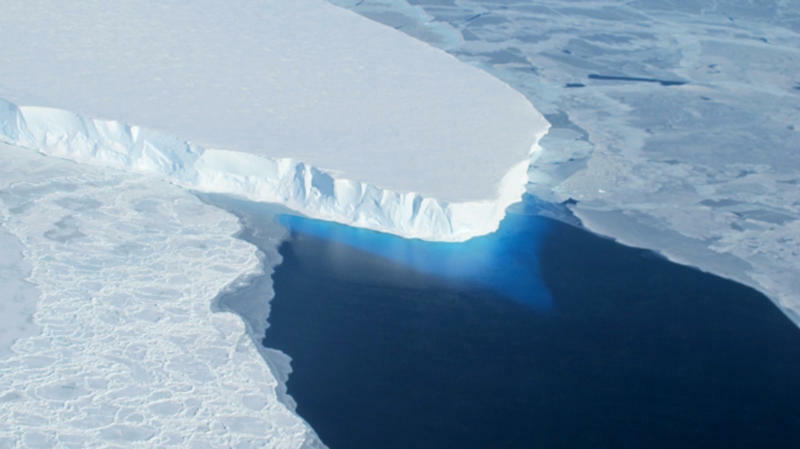 But it could trigger neighboring ice sheet loss that could mean a total of 10 to 12 feet of sea level rise, the study in Science said, and Rignot agreed. The recent reports from the Intergovernmental Panel on Climate Change don't include melt from West Antarctic or Greenland in their projections and this would mean far more sea level rise, said Sridhar Anandakrishnan, professor of geosciences at Pennsylvania State University. That means sea level rise by the year 2100 is likely to be about three feet, he said. Even while the West Antarctic ice sheet is melting, the much larger East Antarctic ice sheet seems stable because it is cooler, Scambos said. Climate change studies show Antarctica is a complicated continent in how it reacts. For example, just last month Antarctic sea ice levels — not the ice on the continent — reached a record in how far they extended. That has little or no relation to the larger more crucial ice sheet, Scambos and other scientists say.